Late model aluminum cylinders cannot be accurately honed without using torque plates.. These plates simulate operating stress conditions when boring or honing aluminum cylinders..
Plates easily adapt to conventional boring bars or a Sunnen type honing machine.. The JIMS torque plates are drilled precisely for multiple applications use, and can accommodate various bore sizes, with stock or oversize big bores.. These kits are lasered lettered for ease of use with torquing sequence and most sets dont require removal of ring dowels..
H-D Twin Cam 88, 96, 103in. with O.E.M. bolt pattern. 1999 to present.. Bore Size 3.75in. - 3.875in. Late model aluminum cylinders cannot be accurately honed without using torque plates. These plates simulate operating stress conditions when boring or honing aluminum cylinders. Plates easily adapt to conventional boring bars or a Sunnen type honing machine. 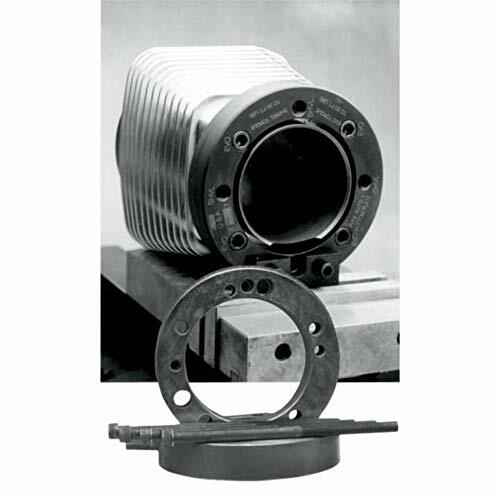 The JIMS torque plates are drilled precisely for multiple applications use, and can accommodate various bore sizes, with stock or oversize big bores. These kits are lasered lettered for ease of use with torquing sequence and most sets dont require removal of ring dowels.